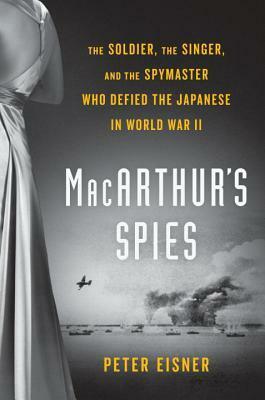 MacArthur's Spies is a harrowing tale of heroism and espionage in the Philippines during World War II. The author chose to focus on the people and events surrounding three main players: Claire (the primary character and the "Singer" in the title), Boone (the "Soldier"), and Chick Parsons (the "Spymaster"). It is broken into five parts: 1) Claire's life before WWII and the Philippines leading into war with Japan; 2) war in the Philippines and the US surrender; 3) life in the Philippines under Japanese occupation; 4) liberation by the US and life immediately following the war; and finally 5) Claire's life in her later years and her battle to get compensation from the US government. I call myself a World War II history nut, but I have a shameful confession - I am one of those who focuses mostly on the European theater, especially the Holocaust. I know very little about the Pacific theater, especially other than Pearl Harbor. Shameful, I know! I chose to read this book in an effort to remedy that and I'm sure glad I did. Despite the somewhat misleading title, the book mostly focuses on Claire - her life, her relationships, her many aliases, and her contributions to the resistance efforts. She was a woman of many mysteries, having married at least four times and somehow adopted a little Filipino girl along the way. Though she aspired to be a performer, she wasn't successful until she opened a nightclub in Manila during the Japanese occupation. At that point she became "Madame Tsubaki," and one of the leaders of the efforts to surreptitiously support both the American POWs interred on the islands and the guerrillas hiding in the densely forested hills. Boone was her contact with the guerrillas. He had escaped capture during the US surrender and led a large contingent of American and Filipino fighters. He was in direct contact with General MacArthur himself via the spymaster, Chick Parsons. Chick had originally escaped imprisonment by masquerading as a somewhat-legitimate diplomat. After his escape, he asked to return and be put to work in the efforts to recapture the Philippines. Without spoiling too many details, we know the historical outcome - MacArthur did indeed return in resounding triumph to liberate the Philippines and vanquish the evil (in this instance) Japanese. He credited much of the success of his campaign to the intelligence gathered by Claire, Boone, Parsons, and their extended network. Many American POWs and guerrillas also owed their lives to Claire and others who provided supplies and money whenever possible. Claire returned to the US a hero. She even wrote a book and had a movie made, although both suffered from the Hollywood effect of an over-eager ghost writer. She spent years trying to get compensation from the US government for all of the money she spent of her own funds to help the guerrillas and POWs. Due to many factors, including the incredible number of people making similar claims, Claire only received a fraction of what she spent. The Filipino people honored her sacrifice after her death by memorializing her in the capitol building in Manila. This book was written by a reporter, and as such it carries with it that style. It is fast-paced and filled with facts expounded by conjecture. Mr. Eisner did a ton of research, even dusting off the court documents from Claire's claim. He is to be commended for his hard work in being thorough, even traveling to the Philippines and interviewing family members and survivors. Claire was a mysterious character and given what little is truly known about her identity, Mr. Eisner did a wonderful job of making her an intriguing character. I only wish he'd been able to expound more on Boone and his troops, or on Chick Parson's harrowing experiences being spirited back and forth behind enemy lines on submarines. There's no doubt that Claire was a hero in her own right; I just would have liked to know more about the other heroes listed in the title (namely Boone and Parsons). There were also times that sentences and/or phrases were awkwardly repeated, or the editing wasn't complete so that the sentence structure was clumsy. Again, with a final edit I'm sure this will be corrected. It in no way detracted from the story itself. My only other criticism is that I would have like to have seen any photos that survived. The author mentions a specific photo - that of Peggy in front of the Tsubaki Club - several times. Why wasn't it included? Again, this might be due to the nature of this particular digital format. Still, I might have to google that photo as well as others of Claire, Boone, etc. They're such intriguing characters! While I still maintain that the title is a little misleading (this is really a book about Claire, with asides about her "supporting cast" and "costars"), the book itself is very enlightening. I had no idea that the Philippines were so crucial in the Pacific war, let alone how much the American POWs and Filipinos suffered (aside from the Bataan Death March - everyone knows about Bataan...I hope...). I would definitely recommend this book for it's educational value alone, let alone the heroism of the people it portrays. I will always have the utmost respect for "The Greatest Generation," especially after reading accounts such as this. I am grateful to Mr. Eisner for highlighting these international heroes! Sign into Goodreads to see if any of your friends have read Macarthur's Spies.